Process once, with Context and Plugin as input. Attach any functionality to a plug-in and tailor it to a particular state; like an action only available via a failed validator, or a successful extraction, or just all-round functionality associated with a particular plug-in. 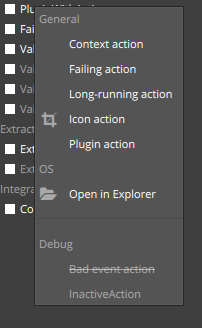 Each action is passed both the Context and it&apos;s parent plug-in at run-time and can be accessed via their argument signature, similar to plug-ins. These objects are available via the argument signature.